As American society gets grayer, families are taking the lead role in providing care for aging adults. Most American adults say a family member is caring for their aging parent who needs help handling their affairs or caring for themselves. And if they’re not already helping out a parent, most expect to do so someday. 1 There are 40.4 million unpaid caregivers of adults ages 65 and older in the United States. Of that group, nine-in-ten are providing care for an aging relative, and a plurality is caring for a parent, according to new data from the Bureau of Labor Statistics. 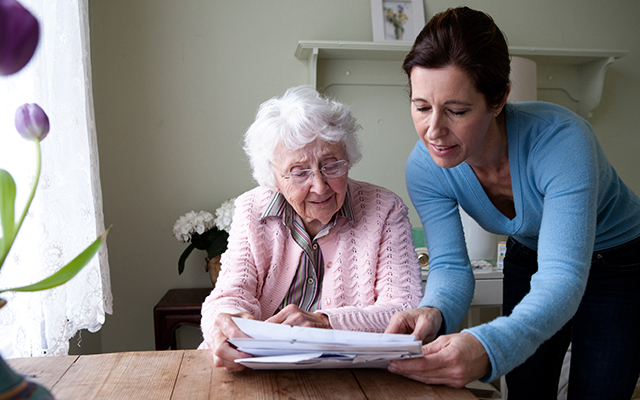 Caregivers may perform a range of activities, such as providing companionship, assisting with housework or providing medical and other forms of physical care. Among caregivers of older adults, most provide help to one aging adult, but 22% provide help to two and 7% provide help to three or more. Roughly half of these caregivers have been providing help for two years or less. More than a third have been providing care for five or more years. 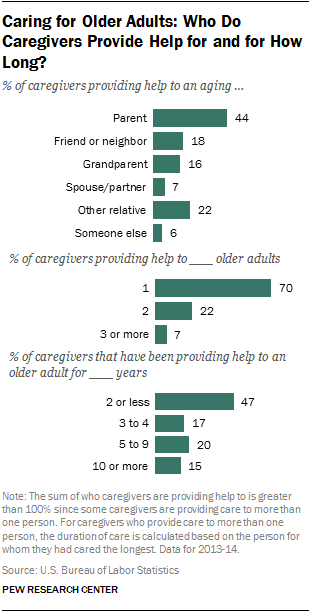 Most caregivers of older adults provide help to others weekly or less often. One-in-five caregivers say they provide care on a daily basis. Many are also juggling their own jobs with their caregiving responsibilities. Six-in-ten (61%) caregivers are employed, including nearly half who work full-time. 2Adults ages 45 to 64 are the most likely to be caregivers. In fact, about a quarter (23%) of adults ages 45 to 64 cares for an aging adult. A significant share of adults ages 65 and older – 17% – serve as caregivers for another aging American. These adults, who themselves are advanced in age, are the second most likely age group to be caregivers. Many in this group are caring for a spouse or partner (29%) or a friend or neighbor (33%). 3 Most caregiving for aging parents is not in the form of financial support or personal care. 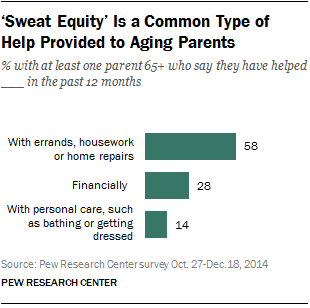 More commonly, adults have helped their parent with errands, housework or home repairs. A recent Pew Research survey asked about specific types of support adults may have provided for their aging parents in the last 12 months. About six-in-ten adults with at least one parent age 65 or older say they have helped their parent with errands, housework or home repairs. A significantly smaller share has provided financial help to a parent age 65 and older. Among this group, nearly half say providing financial support was for a special circumstance, while 43% say it was for a recurring expense. Relatively few caregivers say they helped with personal care, such as bathing or getting dressed. Women are twice as likely as men to say they provided this type of care for an aging parent (19% vs. 8%). 4Emotional support is a big part of caregiving. Most adults say they provide some emotional support for their aging parents, but more women say this than men. Fully 68% of adults say they do this at least sometimes, including about one-third who provided emotional support to their parent frequently. Some 39% of women say they provide emotional support frequently to an aging parent compared with 30% of men. 5 Most adults who have helped an aging parent see it as rewarding; relatively few say it is stressful. Among those who have helped their parents in a matter of ways – financially, with errands housework, or home repairs or with personal care – 88% say it’s rewarding. Roughly one-third (32%) of adults who have helped with any of these tasks say helping an aging parent is stressful. Americans are generally comfortable with the level of care they are providing for their aging parents. About three-quarters of adults with at least one parent ages 65 or older say that their aging parent (or parents) expects about the right amount of support from them. Just 8% say they are expected to do too much for their parents. Women (11%) are more likely to feel this way than men (4%). Note: The Bureau of Labor Statistics defines eldercare providers (referred to here as caregivers of older Americans) as anyone age 15 and older who has provided unpaid care to any adult age 65 and older in the last three to four months because of a condition related to aging.